A little local knowledge can make your trip more memorable. 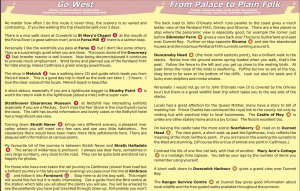 I have brought together information in my printable tour guide (PDF, 600Kb) that you may find useful in your planning. Most people coming this far North will go to John o’Groats. Many will be disappointed. However round the corner, just a walk away, is one of the most magnificent views in Britain. 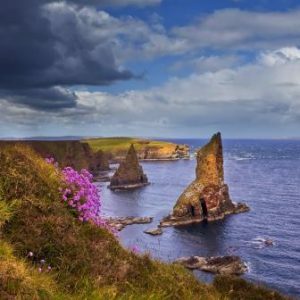 These sea stacks as photographed by Stewart Watt can be seen as you walk along the coast. There are good reasons to go to John O’Groats. There is a very good passenger ferry (often see whales/seals etc) and an organised tour of Orkney (takes in all the major sites). There are boat trips that can take you for a sea side view of the coast. There are some shops and a café and parking is free. There is the signpost for a photo opportunity. However at Duncansby Head not only is the view of the stacks magnificent but you can get very close to the ample birdlife (you don’t need binoculars) and see seals around the cliff base. Orca (killer whales) can sometimes be seen waiting for the seals to venture back in the water. There are rare flowers and a spongy feel to the ground when you walk. Most of all, you really will feel that you are on the top of the world with only nature and wide horizons around. 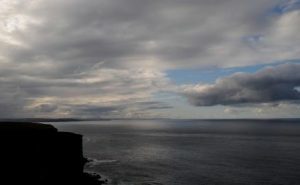 Of course, for the most Northerly point you have to go to Dunnet Head. It is a bit of a drive but well worth it for that “top of the world” feeling. 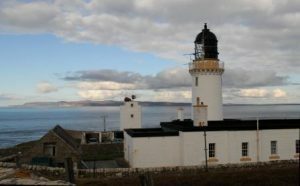 For those with an architectural interest or if you are a “lighthouse bagger” both Dunnet Head and Duncansby Head are Stevenson family lighthouses. The Castle of Mey lies about halfway between John O’Groats and Thurso. Home to the late Queen Mother it opens to the public from May to September. It is now run as a charitable trust under the keen interest of HRH The Prince Charles, Duke of Rothesay who continues the tradition of royal visits. The house is a testament to the warmth of the Queen Mother (most people in Caithness will have a personal story to tell). The gardens are a tranquil haven and the food is very good in the café. For opening times click here. 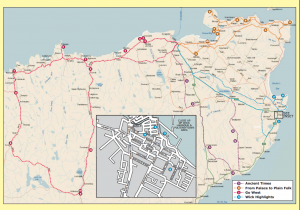 For other hints about places to see on the road up from Inverness and around Caithness take a look at my printable tour guide (PDF, 600Kb). It shows some interesting places just off the main roads that could otherwise be missed. 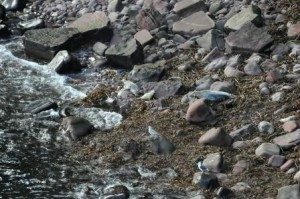 Here are some of the many places worth visiting:- Camster Cairns, Mary Ann’s Cottage, Whaligoe Steps, Achavanich Stones, Flagstone Trail in Castletown Wick Harbour & the Isabella Fortuna, all of which are included in the guide. We have a lot more tourist information in our information packs. We use Facebook to show the more quirky side of our area and to publicise local events.